If you've ever flown from a major U.S. city to Tokyo, the horror of sitting in a cramped, economy-class airplane seat for such a long flight sinks in. Minutes slow down and the waiting is a little like agony. Imagine sitting roughly 11 hours between San Francisco and Tokyo, or even worse, 14 hours between New York or Boston and Tokyo. Now consider how much longer that travel time would be if you broke up the flight into two or three legs with transfers. Of course, with such a long and complicated flight, many things can go wrong. Here are five tips to make life a little bit easier. 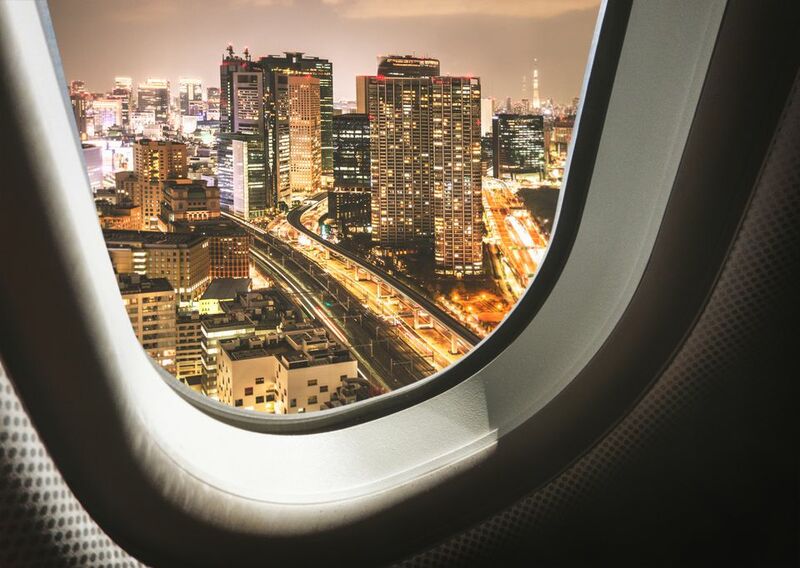 Unless you're flying directly into Narita to get to Tokyo, there's a good chance you'll need to catch a domestic flight to nearby Haneda International Airport. If flying from Boston to Okayama, you'll look at your flight itinerary and see something like this: Boston to Narita to Haneda to Okayama. You'll have maybe a three-and-a-half hour layover at Narita and think: How hard could this be? Well, unless you know what you're doing, there's a good chance you could end up missing your flight from Haneda to Okayama. This is because it's usually left up to you to decide how to get to Haneda, which is about an hour away depending on traffic. And you must pay your way there. On top of that, you'll almost certainly have to pick up all your checked bags in Narita, and then lug them to Haneda to recheck them. How to get to Haneda? The bus. You'll need to look for the orange signs for the airport limousine and buy tickets, which are reasonably priced, at the service counter on the first floor of Narita, not far from where you'll pick up your luggage. Tell the workers at the counter which airline you'll be taking, Japan Airlines or All Nippon Airways, so that you go to the correct gate. Once you're at Haneda, you'll have to go through security again, get your boarding passes, and check luggage. It's easy to want to jump on the cheapest deal, but unfortunately, those tend to come with strings attached. For example, if you book from a third party website (like Orbitz, Priceline, Expedia, TripAdvisor, etc.) you often can't make any changes to your ticket. Similarly, if a situation occurs—let's say you get bumped from your seat—you may not be able to get a refund and will be forced to buy a new ticket. Buying tickets directly from the airline can help avoid such trouble. But it's also good to work with Japanese travel agencies such as Amnet, which can get good prices, too. Now, with Boeing 787s back online, you can cut your flight time by flying direct from more cities. Despite the so-called Dreamliner's battery woes, the small, lightweight aircraft are a pleasure to fly on, with their slick design, windows that darken at the press of a button, and limited seating compared with jumbo jets. But taking a direct flight might not always be the best thing to do, especially if you're flying with babies or toddlers. It's one thing if you'll be flying straight to Tokyo or Osaka, then going straight to the hotel. It's another, however, if you'll be heading to other cities and will need connecting flights, trains, or buses, which, when added to the initial drive to your local airport, can make your door-to-door trip time easily 20 or more hours. Ask yourself: Would it be better to break up the trip, have lunch and walk around in the connecting airport, or even stay overnight in, say, San Francisco or Osaka, before heading toward the rest of your trip? A good night's sleep on the first night, on Japan time, can go a long way to alleviating jet lag and enjoying the rest of your trip. If this is your first flight to Japan, and you've never been on a plane that long, you might not know how much you'll want a sip of water after you hit the three- or four-hour mark on a 13-plus-hour flight. By seven hours, your throat dries out from the recycled air in the plane. Different airlines are more generous with drinks, but in any case, why not have your own supply? In addition, don't forget to walk around every hour or so and stretch; keep reminding yourself that you are trying to avoid deep venous thrombosis or blood clots in the legs. If you're traveling with toddlers, be especially prepared. You'll know the entire time that your kids will at some point explode into tears of frustration from being cooped up in the plane, and you'll have to calm them down when they do. But advance planning can help. For the flight, some passengers find that low-sugar drinks and snacks, such as freeze-dried fruits, keep kids distracted when they get upset. Asking for a kids' meal in advance, if your airline offers it, is also a good bet. JAL is far better at responding to kids' needs like this than Delta. If your tot is in diapers, bring at least 10 more than you think you'll need. Nothing's worse than running out before you find somewhere to buy new ones. Reconsider the virtue of layovers when you travel with children. Check in advance to see if the airport where you have a layover has a play area for kids and find out how to get there. A play area would allow him or her to let off some steam midway through the trip. Haneda offers a small cushioned play area for toddlers and so do other airports. You'll need maps for Haneda, for Narita, and for Kansai in Osaka. Finally, when the airline attendants offer to let you board the jet first, consider whether that's a good idea. You'll be sitting in your cramped seats for at least 30 minutes before takeoff, adding to the already long time your child will be cooped up in the plane. Waiting to be the last one to board seems so much wiser when you travel with children. What Are Some Japanese Gift-Giving Customs? What Is the Best Way to Move Your Pet to Japan?